A group of astronomers led by Suvi Gezari of Caltech recently surveyed more than 10,000 galactic cores—and they caught one! In a distant, unnamed elliptical galaxy, a star fell into a central black hole and "burped" a blast of ultraviolet radiation. Studying the process in its entirety “helps us understand how black holes feed and grow in their host galaxies,” notes Martin. "Now that we know we can observe these events with ultraviolet light,” says Gezari, “we've got a new tool for finding more." For more on this and other findings of GALEX, see www.galex.caltech.edu. For help explaining black holes to kids, visit The Space Place at spaceplace.nasa.gov. 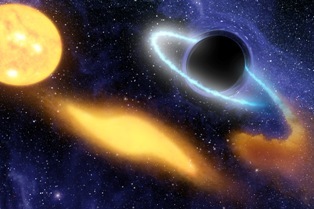 In this artist’s concept, a giant black hole is caught devouring a star that ventured too close.